I've been hearing great things about this book, so perhaps my hopes were too high. This book irked me in the same way as The Higher Power of Lucky did: cutesy, too-good-to-be-true, innocent kids in hard-knock lives just drive me nuts. 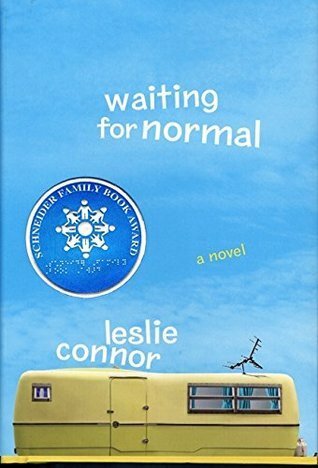 Addie is on the brink of puberty, has severe dyslexia, and lives with her unmedicated, bipolar mom in a trailer in a grim corner of Schenectady; her two little sisters and loving stepdad have started a new life in the country, but her mom has custody of Addie. But thanks to Addie's unfailingly positive outlook, everything is bathed in sunshine: she makes an instant BFF in her new school, gets a flute solo, and develops a deep friendship with the folks at the convenience store across the street. The stuff of Newbery awards ensues (the convenience store owner is fat and has cancer and her best friend is gay, both circumstances that allow the reader to appreciate just how nonjudgmental Addie is... but also guarantee some tears near the end). First of all, Addie and I (or maybe the author and I) started out on a bad note: I was irritated from the first mention of "Mommers" on page one. "Mommers"? From then on, I couldn't believe her as a character. Could any seventh-grader in this situation be so naive, terminally cheerful and UN-resourceful ("toast dinners" notwithstanding)? She never considers putting aside money for Mommers's long absences; it doesn't occur to her that letting her unreliable mother take care of her beloved hamster is a bad idea? It's hard to respect a character who's... sort of pathetic. Then I felt guilty, because this is undeniably a terrible situation for a child to be in, and I think a good number of kid/YA books propagate a dangerous myth that children in bad situations can and will cope without adult intervention. But jeez, Addie, grow a backbone! Make some smart decisions! And please, Newbery committee, don't give this one the medal this year. I'm barely into this story and I'm not sure I can stomach one more "Mommers". You should keep reading it you will like it!